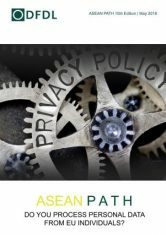 The 15th edition of ASEAN Path, dealing with the European Union General Data Protection Regulation (GDPR) coming into force shortly, is now available for download. In this edition, DFDL first provides analysis on the impact of this new regulation on businesses beyond the frontiers of the European Union, then considers the resulting obligations pertaining to the processing of personal data as well as the significant related penalties and, lastly, outlines suitable measures to consider implementing to ensure full compliance with the GDPR. To download the ASEAN Path #15, please click here.